Be the first to share your favorite memory, photo or story of Tazuko "Taz". This memorial page is dedicated for family, friends and future generations to celebrate the life of their loved one. 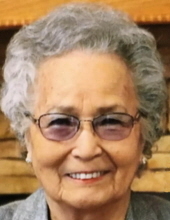 Tazuko “Taz” Hardyman, age 84 of Darlington, WI passed away Friday, February 8, 2019 at Agrace Hospice Care in Fitchburg, WI. She was born September 25, 1934 in Tokyo, Japan. Taz grew up in Tokyo where she lived and met the love of her life Harold T. Hardyman. They were united in marriage on April 2, 1958 in Tokyo, Japan. Following their marriage, they moved to Fayette, WI then moved to the Darlington area in 1970 where she was a homemaker and farmer. Taz is survived by her children: Dan (Linda) Hardyman of Port Huron, MI, John Hardyman of MN, Joe Hardyman of Browntown, WI, Jim (Jeannelle Jones) Hardyman of Fitchburg, WI, Tina Hardyman of Lafayette, LA, and Larry (Krista) Hardyman of Belmont, WI; and grandchildren Josh and Jeremy Hardyman, and Anna and Logan Hardyman; and one sister Eiko of Japan. She was preceded in death by her parents, and her beloved husband, Harold Hardyman on March 9, 2004. Taz was a member of Holy Rosary Catholic Church in Darlington. She cherished her family, especially her grandchildren, and the memories they all created together. Taz will be sadly missed and fondly remembered by her family and friends. A Mass of Christian Burial will be held Wednesday, February 13, 2019, at 11:30 A.M. at Holy Rosary Catholic Church a branch of Our Lady of Fatima Parish (104 E. Harriet St., Darlington) with Rev. Joji Reddy officiating. Burial will be in Holy Rosary Cemetery in Darlington. A visitation will be held Tuesday, February 12, 2019 from 4:00 P.M. until 8:00 P.M. at Erickson Funeral Home (508 Main Street, Darlington). A visitation will also be held Wednesday, February 13, 2019 from 10:30 A.M. until 11:15 A.M. at the church. Online condolences may be expressed to the family at www.ericksonfuneralhome.com. In lieu of flowers, a memorial fund has been established for the Hardyman Family. To send flowers or a remembrance gift to the family of Tazuko "Taz" Hardyman, please visit our Tribute Store. "Email Address" would like to share the life celebration of Tazuko "Taz" Hardyman. Click on the "link" to go to share a favorite memory or leave a condolence message for the family.